BigHominid's Hairy Chasms: "worshipped as a god"
...and then something occurs to me. Imagine all the people you know, or have briefly encountered, who have Down Syndrome or the vestiges of polio or some genetic disease that leaves them horribly disfigured and even difficult to look at. Imagine the lives these people lead in Western society, where they're shunned and marginalized—not only by actively cruel people, but also by those who might otherwise be decent folks. How different would the world be if, instead of people reacting to these stricken beings with fear and loathing and queasiness, people reacted instead with feelings of respect, awe, and veneration? What if, in such instances, we remembered that the duty of the strong is to protect and cherish the weak? What if, like Saint Francis, we stop along the path and embrace the leper? So who, I ask you, are the real stupid primitives in this scenario? *Good Lord, that "Holy cow!" pun never gets old, does it? Yeesh. That calf is still freaking terrifying, though. It does have the look of a video-game character. 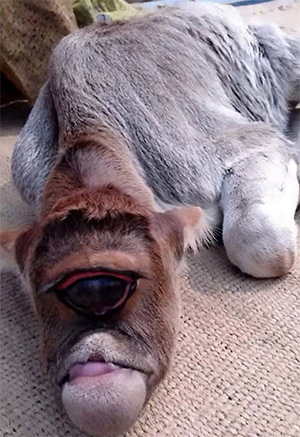 If it turns out the calf can shoot lasers out of its eye, then we're set. Oddly enough I encountered a man with half a face last night. Not sure if it was cancer surgery or a combat wound or what and of course I didn't ask. What impressed me was he was playing in a big darts tourney and to the other darters he was apparently just one of the guys. It certainly puts things in perspective though. Would I have the courage and confidence to carry on with a public existence looking like a freak of nature? I admired that this guy found the strength to do so.